merrily karolys: The Three Laws of Robotics and why I wish I had put those chocolate chips somewhere else. The Three Laws of Robotics and why I wish I had put those chocolate chips somewhere else. Law #1: A robot may not injure a human being or, through inaction, allow a human being to come to harm. Law #2: A robot must obey orders given it by human beings except where such orders would conflict with the First Law. Law #3: A robot must protect its own existence as long as such protection does not conflict with the First or Second Law. 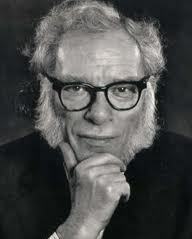 Isaac Asimov. This picture is amazing. I, Robot is a fascinating collection of stories by Isaac Asimov that explore the interaction of these three laws and in what situations robots might malfunction while trying to follow them. In one story, when a robot has its Law #3 strengthened a bit by its programmers, it becomes "drunk" as it vacillates between saving a human's life and keeping itself from harm. It goes cuckoo and recites poetry while running in a circle. I realized the other day that I, too, have a few laws I live by. Law #1: You should try to limit the unhealthy food you ingest. Law #2: Chocolate and ice cream (and chocolate ice cream) are delicious, and you should eat as much of them as you want. Look, we all know that Law #1 is supposed to be supremely important. But for some reason, my Law #2 has been strengthened. Who did that? Not my fault. Law #3: Exercising can be difficult, but it feels great. Will this law balance the other two? Will it save me? Will it? Only time will tell. this isn't actually chocolate, it's dirt. Uh-oh. I just discovered Law #4, which might trump all previous laws: The R*&ch Law. I saw a r^@ch in our garage yesterday in a box right in front of our extra freezer. The freezer which happens to contain the chocolate chips AND the ice cream. Things just got real. If I start spouting poetry, you'll know why. Love it! I'm trying to exercise too and I feel great when I do. I'm trying to get back in the swing of exercising every day. Dark chocolate is officially medicine, so now I only have to worry about ice cream, right? Maybe since it has protein in it, it could be medicine too? Oh well. I tried. Exercising is an absolute necessity for me these days. Robot science fiction? That kind of book just makes my head hurt. It's just too complicated for me. Sounds like something JJ would enjoy too.